Das zweite Album des schwedischen Synthpop-Duos. The debut album “Cold in the State of Me”, released in 2008, was one of the most successful debut albums ever released by Memento Materia. It was chosen as the Album of the Month by the alternative music magazine Sonic Seducer and the reviews were fantastic. 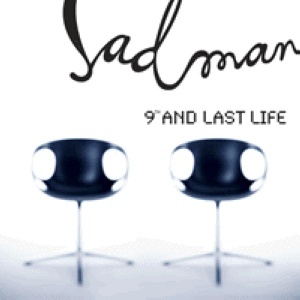 On Sadman’s new album “9th and Last Life” you will experience a beautifully dark electropop/rock soundscape presented with even more confidence and craftmanship. Here you have a band that knows how to combine the tranquil and atmospheric with the harsh and angry – creating a vivid and invigorating soundscape with influences from bands like Radiohead and Depeche Mode. That the success has resulted in confidence and trust shows in the truly remarkable variation offered on the new album – darker, rougher tracks in “I Hide”, “9th” and “How” mixed with softer, more laid back tracks in “Angel (in the leap)”, “I’m off” and he stunning ballad “End up in a Calm”. Add to this electronically infused pop tunes in “Gone” and “Drama” and you are again presented with a wide spectrum of high quality music. And prepare to be surprised – there are parts on this album more sinister than you have ever heard before from this band.